In our concluding post on implementing a winter HVAC plan, we focus on Chilled Water and Hot Water Coils, Economizers, and Data Centers. As mentioned in Part 1 where we covered Cooling Towers and Closed Circuit Coolers, HVAC systems require special attention to ensure they are protected throughout the bitter cold months. There are a few important considerations that should be part of the winter maintenance plan to ensure your employees, tenants and customers are provided with a comfortable environment. Any coil that utilizes water and is exposed to outside air must be addressed as part of your facilities’ winterization plan. Controls should be evaluated prior to cold weather for proper operation. Freeze stats also need to be checked to make sure they are set to the correct temperature to protect the coils. A visual inspection needs to be done periodically throughout the winter months to ensure all freeze protection controls are effective. It is likely your air handling system is equipped with some form of economizer that allows the unit to directly use outdoor air for cooling. This type of air conditioning is often referred to as “free cooling” because it operates without the use of energy required to run a compressor. It is extremely important to work with your HVAC specialist to ensure that your economizer is operating properly. We often find airside economizers that are operating improperly or disabled entirely. If the economizer dampers are stuck closed, you will not be able to take advantage of free cooling. If the damper fails to close, frigid air would be brought in and heated – resulting in wasted energy, an uncomfortable environment, and nuisance alarms. In the event of a power failure these open dampers can lead to frozen sprinkler or water piping. 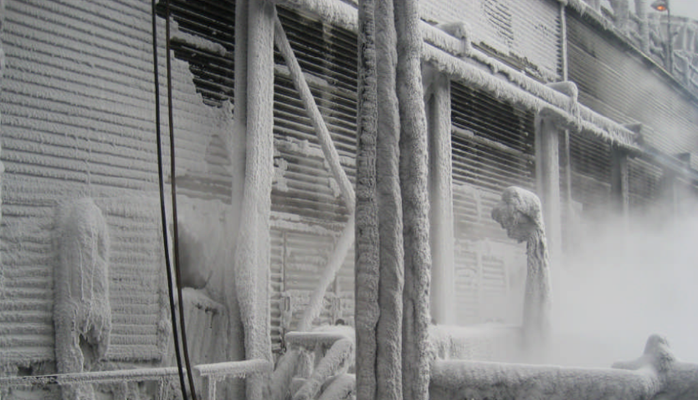 Often overlooked as part of a winterization plan, data centers present a unique set of potential cold weather issues. Because data centers utilize cooling year-round, special care must be taken to make sure these cooling systems run during the coldest temperatures. Head pressure controls that keep refrigeration system pressures from dropping too low need to be checked prior to cold weather. Thermostatic fan controls on both outdoor condensers and dry coolers need to be calibrated prior to winter to make sure they control the fans at the proper temperatures. Humidifiers need to be inspected and tested. Winter is when the humidifiers are most needed since relative humidity levels drop. A good facility winterization plan requires early planning, a heightened level of vigilance and some targeted tasking to the areas most at risk. Once in place, your facility will be safe, comfortable and operate efficiently all winter long.